On behalf of the Mirror Lake Association and Mirror Lake Management District, welcome to Mirror Lake! Mirror Lake is located in northeast Sauk County, Wisconsin near the Wisconsin Dells. Like the Wisconsin River Dells, Mirror Lake is lined with 40 to 50 foot Sandstone Cliff. Mirror Lake is a slow-no-wake lake for the entire lake which helps to preserve these picturesque cliffs. It is popular with kayak, canoe, paddleboard, and pontoon boat enthusiasts. Fishermen can catch bluegill, crappies, large mouth bass, northern pike and walleye. Bird watchers can see a great number of birds such as sandhill cranes, bald eagles, herons, turkey vultures, geese and ducks. 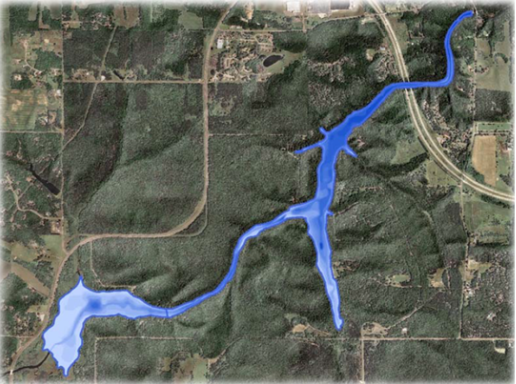 Mirror Lake is a 4 mile long 137 acres impoundment of Dell Creek. 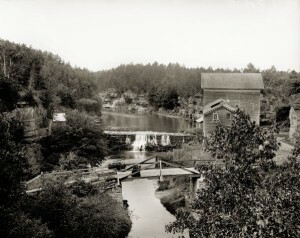 The old log dam built in 1857 to power a sawmill and later Timme Mill is now covered with concrete at the east end of the lake and is one of the oldest dams in Wisconsin. The boat landing there provides a portage site to Lake Delton and from there the Wisconsin River. The 132 square mile Dell Creek Watershed that drains into Mirror Lake consists of 51% agricultural, 18% developed and 31% woodland and surface area. 40% of the Dell Creek Watershed is in Juneau County and 60% is in Sauk County. Mirror Lake State Park opened in 1966 on the west end of the lake. It’s 2,000 acres surround 70% of Mirror Lake’s shoreline. Pine and oak trees surround the lake atop the sandstone cliffs. A boat ramp also provides kayak, canoe and pontoon boat rentals. The beach with its picnic and swim areas is popular in the summer. 19 miles of hiking and 9 miles of biking trails traverse through the woods, prairies and abandoned farm fields in the process of reclamation by the natural wild flowers, shrubs and trees. Cross ski trail provide winter recreation. Ishnala Supper Club with it’s excellent food provides a great view of Mirror Lake from the bar, restaurant or outside terrace.